The Kathy Collection by Jennifer Taylor Home is the perfect addition to any living space looking to add a bit of a contemporary flair. Wrapped in high-quality fabric, the solid wood frame is made from kiln-dried birch which provides exceptional support and stability. 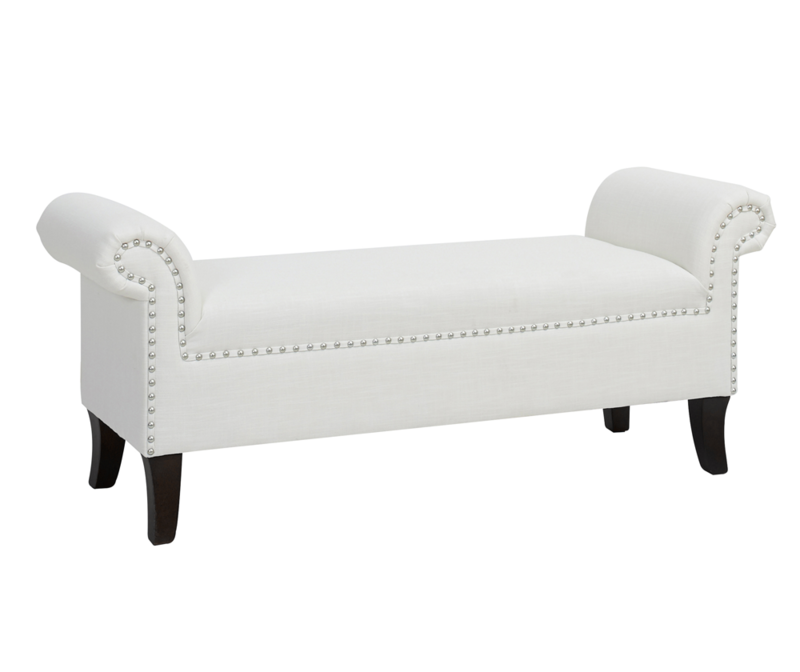 The clean look of this bench and its nail head accent trim along the edges makes it a lovely addition just about anywhere around your home or office. The Kathy roll arm accent bench is an ideal choice for the entryway, hallway or living areas. This bench brings class and lounging comfort to any room. Jennifer Taylor Home offers a unique versatility in design and makes use of a variety of trend inspired color palettes and textures. Our products bring new life to the classic American home. The Kathy Collection by Jennifer Taylor Home is the perfect addition to any living space looking to add a bit of a contemporary flair. Wrapped in high-quality fabric, the solid wood frame is made from kiln-dried birch which provides exceptional support and stability. 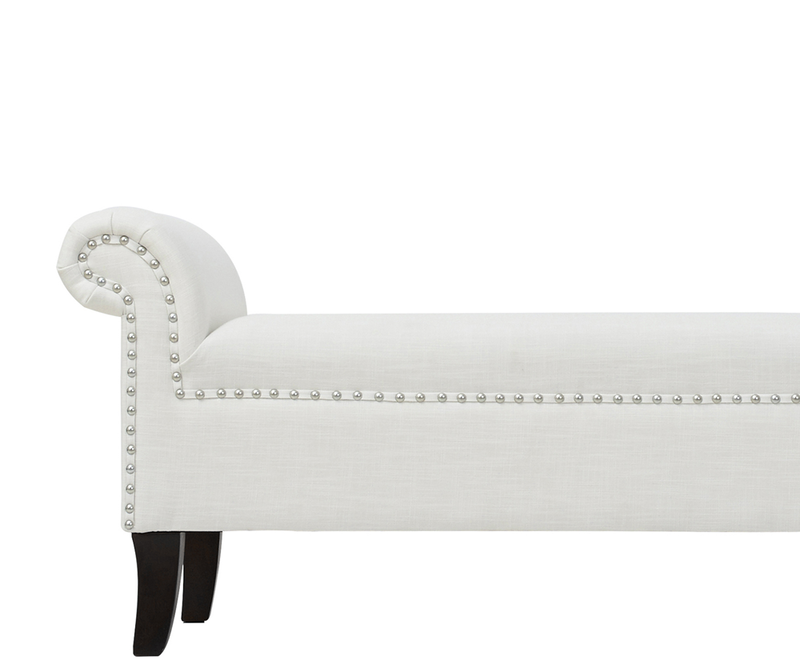 The clean look of this bench and its nail head accent trim along the edges makes it a lovely addition just about anywhere around your home or office. The Kathy roll arm accent bench is an ideal choice for the entryway, hallway or living areas. This bench brings class and lounging comfort to any room. Jennifer Taylor Home offers a unique versatility in design and makes use of a variety of trend inspired color palettes and textures. Our products bring new life to the classic American home. Love this at the foot of my Queen bed. Perfect and prettier in person! Love this little bench! Fits perfectly in my entryway. The fabric is soft. The bench has a hard cushion though. Well made & sturdy. Very pleased w/this purchase. this is cute. it is a bench. it's not a soft seat or chaise, not for sitting but a good place for your bedspread or pillows or to put your clothes from the laundry. the fabric is pretty chenille, the stitching is nicely done and it's detailed well. it's a tad low...make sure the height works for your space--i might change the legs. o.com had the best price on this too! overall, i would recommend it more for the end of a bed not an entryway. Nice lightweight bench for under a window or at the foot of the bed. It arrived securely boxed and in perfect condition. The fabric is more of a vanilla or light oatmeal color, not bright white. The fabric is textured and a bit rough to the touch. The studded edges are a stainless steel look. The 4 legs are a dark expresso color, not quite black and come separate and you need to screw them on - very simple, no tools needed. It's a nice bench and I have a few places in our house where it will look great. Happy with my purchase and it was a good price. It is very well made, not super heavy. It came ready assembled so no tools needed. It sat very stable on the floor and the cushion is very firm. Love my sofa! Comfortable, large and beautiful color.